Daniel has been performing ever since he was a young boy. Introduced to stage performances by his parents at 5 years old he began a journey to develop into the great entertainer he is today. Owing his style to not only years of training but learning from those great performers who created the world of entertainment, performance, and music. 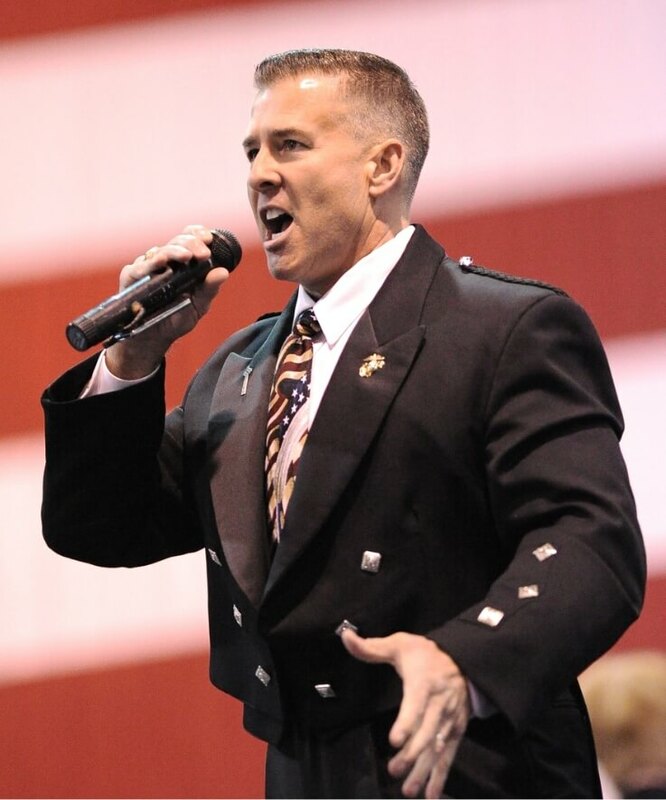 Meet Daniel M. Clark known as "The Singing Trooper"
Performed in uniform while representing the Commonwealth of Massachusetts during his 20 year career. During this tenure with the State Police he performed at more than 2,500 events for Federal, State, Local, and Military functions. He also performed 25 foreign National Anthems, in native dialect, for visiting dignitaries and sporting events. In addition, for 5 years, he could be heard on “Radio Disney” as “Trooper Dan”promoting safety for children. Clark began performing as a youth and continued through High School as part of two “All- State Choirs” (as a soloist) when he was selected to perform with the “All Eastern Chorus” in Washington DC. He studied at the prestigious “Young Vocalist Program” at Tanglewood for two summers after which he joined the cast of the College Light Opera Company in Falmouth Massachusetts. After 2 years of study at the University of Delaware he took a hiatus from singing and enlisted in the United States Marine Corps. He was selected as ‘honor graduate’ of his platoon from Parris Island and was trained in Avionics and stationed at MCAS New River to maintain the CH-53 A/D Helicopters. He received a meritorious promotion to Corporal and was selected as “Marine of the Month”. After 4 years of service Clark received an honorable discharge as a Sergeant in May of 1984. Clark then took the exam for the Massachusetts State Police on 10 November 1984 (USMC Birthday) and subsequently entered the next class into the academy in July 1985. Asked to perform our National Anthem while in the State Police Academy Academy graduated and became a Trooper with the legendary Massachusetts State Police. In 1988 Governor Michael Dukakis heard Clark sing at the funeral for a fallen Trooper and introduced him to “Kitty” Dukakis’ father, Maestro Harry Ellis Dickson of the Boston Pops. In 1993 he was invited to sing “America the Beautiful” on the occasion of the song’s 100th Anniversary on Cape Cod with Maestro Dickson for his first appearance with the Pops. Maestro Dickson and Clark performed many times together over the next few years when in 1998 Clark was invited to perform with legendary Keith Lockhart and the Boston Pops on “Pops Goes the Fourth”, a Fourth of July extravaganza televised nationally on the A & E Television Network. As a result of this appearance People Magazine published a feature article on Clark, which prompted his appearances on the “Rosie O’Donnell Show” and the “Donnie and Marie Show” where he sang a duet “Danny Boy” with Donnie Osmond. Since then Clark has made appearances with the Boston Pops at Symphony Hall making a return to “Pops goes the Fourth” in 2001. Boston Sports Fans have seen Clark open numerous games and seasons performing the National Anthem for the New England Patriots, the Boston Red Sox, including the Ted Williams Tribute with the United States Marine Corps Band in 2002 and for the 2003, 2004, 2007 ALCS, and 2009 ALDS, the Boston Bruins, the Boston Celtics, the Marine Corps Marathon in Washington DC and for many other local sports teams. He has also been opening the Boston Marathon since 1990 (and also ran the marathon, after singing, in 2002 & 2009) and in July 2004 opened the Democratic National Convention in Boston. In 2012 the National Geographic Channel used his National Anthem as a part of the 100th anniversary tribute documentary for the historic Fenway Park! 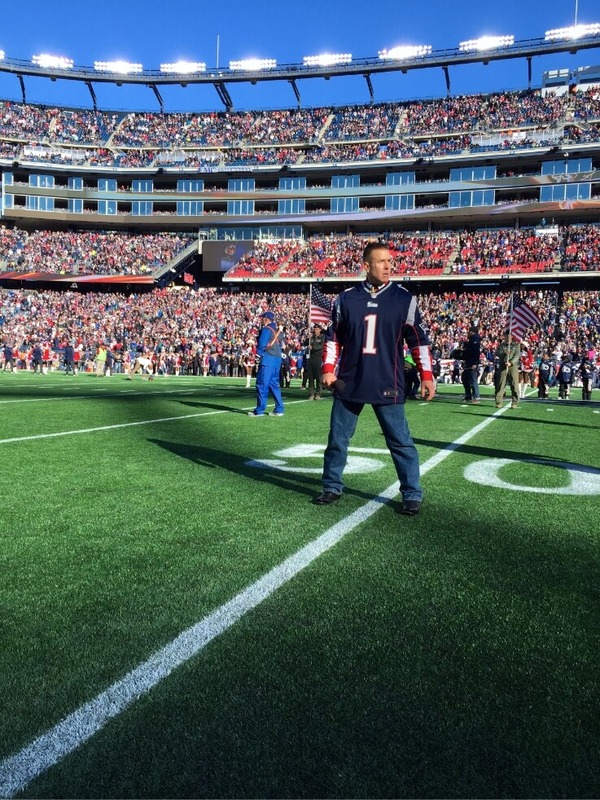 In the fall of 2013 he returned to Fenway Park on three occasions to perform “God Bless America” for the Boston Red Sox during the 7th Inning Stretch. The first was the last series with their arch rival New York Yankees. The Second was for the 1st Game of the ALDS vs. TAMPA BAY. 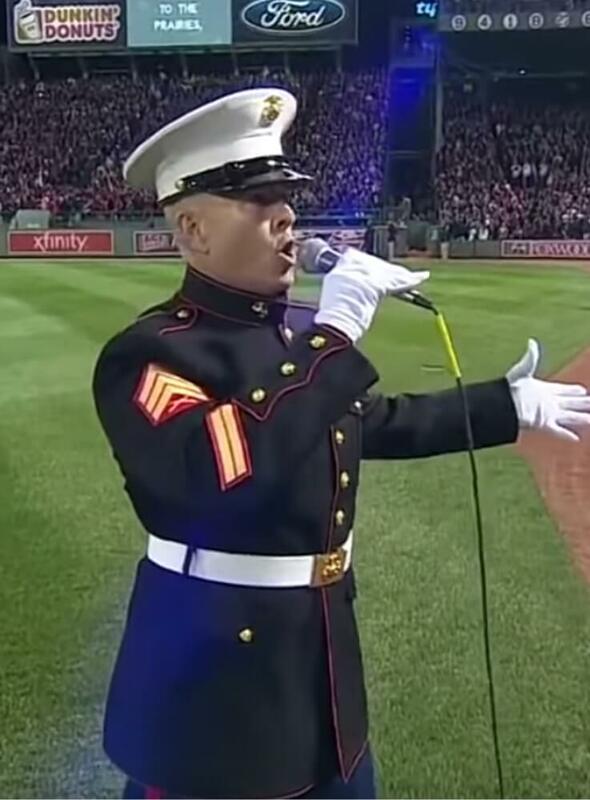 The final appearance was at the 1st Game of the 2013 World Series vs. ST LOUIS while dressed in Marine Corps Dress Blues, for the first time in 30 years, to honor the service men and women who have given so much to this great nation! GOD BLESS AMERICA! On August 9th of 2015 Clark had the honor to perform for the 30th Anniversary of “Pops by the Sea” in Hyannis with Keith Lockhart and the “Pops” to celebrate the tradition of this concert and the memory of the great man who created it; Harry Ellis Dickson! In addition on November 22nd Fenway Park Opened it’s “doors” to the 3000 year old sport of Hurling. They hosted teams from Dublin and Galway to compete in this historic event and I had the honor of singing the Irish National Anthem in Gaelic and the Star Spangled Banner for the packed house at Fenway! 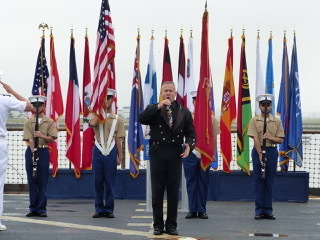 In June 2017 Clark was part of the prestigious SAIL BOSTON event as a part of the Opening Ceremony aboard the USS Widbey Island in addition to (2) Sunset Tribute Performances. In November 2017 Clark received the prestigious Lt. 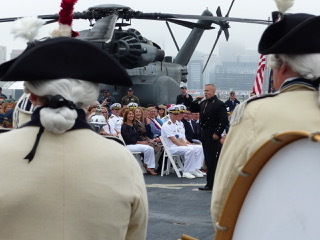 Colonel William F. Deagan Award at the Semper Fidelis Society’s Annual Boston Marine Corps Birthday Celebration extravaganza. This was for Clark’s extensive contribution to countless Marine Corps and Military support events held throughout the New England Region! 2018 brought return performances to many of his favorite events such as Women’s and Men’s Gymnastics Competitions, Manhattan Classic, and USAIG World’s in Orlando. A return to the great Fenway Park and the Boston Red Sox for both the ALDS and ALCS games performing God Bless America. The USMC Marathon in Washington DC which includes not only the National Anthem to open up this prestigious marathon but numerous show performances. A new venue this year is the HARD ROCK STADIUM in Florida to open for the Miami Dolphins! Clark still continues to travel the Nation with his unique style of inspirational performance and entertainment! Mary Colarusso, a coloratura soprano, is a graduate of the Boston Conservatory of Music holding a Bachelor’s Degree in Vocal Performance. Since graduation she has been the lead soprano for both the Lowell Opera and Boston Bel Canto Opera companies where she performed her title roles of Violetta in La Traviata and Gilda in Rigoletto. She has also performed with the Boston Classical Orchestra for Harry Ellis Dickson’s Birthday Extravaganza hosted by Mike Wallace and with the Boston Civic Symphony for their Valentine’s Day production hosted by Ron Dellachiesa. Joyce Kulhaywick on her Channel 5 WCVB Arts and Entertainment segment also featured Mary performing her art. Mary currently appears in concert with her husband Sgt. Daniel Clark, known as “The Singing Trooper,” to audiences around the Nation. In the fall of 2005 Mary and her husband performed for former President and First Lady George and Barbara Bush as part of their efforts during the Bush-Clinton Katrina Relief. 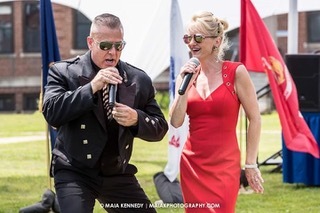 In addition to her concert performances she also takes great pride in delivering a spectacular National Anthem, which she has performed for the New England Patriots, Boston Bruins, Boston Celtics, Boston Marathon, and aboard the USS Constitution. Mary had a special invitation to attend the 2012 Academy Awards in Hollywood on February 26th 2012. She was wisked away in her limousine and had the thrill of walking the ‘RED CARPET’ along with attending the Academy Awards! (If you looked closely during the National Television coverage of the event you could spot Mary and Courtney having a great time!) Afterward she had an exclusive invitiation to the ‘Governor’s Ball’ where she got to rub elbows with some of the most legendary actors and actresses of our time! To top off the evening those in attendance were treated to a legendary performance by the one and only Tony Bennet as he delivered his impeccable version of “I Left My Heart in San Fransisco.” ……she’s just living the dream! !